Why should you make personalized photo books? Of all the wonderful wishes we ask from the universe, time machine comes on the top list. Human beings, who are the rarest species on earth that has everything to do with the emotions, often craves to go back in their happy times. But happy times seems to have been in the ‘past’, always. Unfortunately, scientists have not invented any sort of machine which takes us back in our past time i.e. good old days, of course. Until we could sit on such innovative couch, it’s good to have a simple and inexpensive way to relive our special good moments. Well, the best alternate homosapiens could find is ‘Photo Book’. It is human’s gateway to enter into the new world and relive blissful times. Hello, there? Or gone with the time? Now, do you find the urge to create a personalized photo book of your own or for your loved ones? There are many happy reasons why you should make a photo book (it has everything to do with emotions, not emoticons :p). Click, Click, Click, Cloud, Repeat. Phew, that’s a lot to click in. The most wonderful moments of our life are kept in smartphone or cloud, it never gets to come out of it and be ‘Real’. Too much of digitalization has resulted in piling up our social profile and nothing beyond it. When you feel it through the medium of an artificial touch screen, you can neither fully rejoice it nor celebrate it temporarily whereas the larger-than-life moments deserve to be cherished forever. 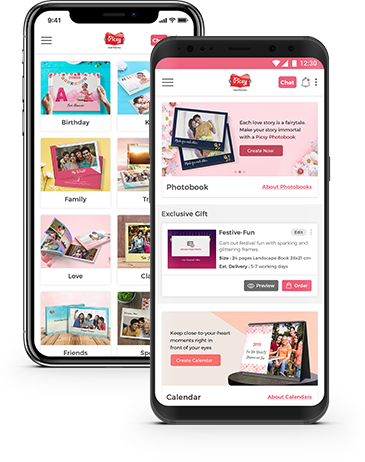 Don’t leave best moments of your life locked away on your phone but feel it in your hands for lifetime with printed photo album. Trouble collecting all your memorable moments at the same place? Stop hiding your special moments in files & folders. There’s nothing more ecstatic than reliving your nostalgic moments. Revisit happiest memories of your near and dear peeps in a go. Sounds like, a personalized photo album is a forever keepsake that can be enjoyed anytime when flipped with smiles and laughter. Amidst hustles and havoc of everyday life, relax and find time that makes you smile undoubtedly. What if that relaxation is as simple to reach as the stress ball but far better? Picsy Personalized Photo Books, full of your stunning moments, rejoices every incredible moments of life and makes you smile – make it your forever Buddy. So, until scientists find their Eureka moment and invent time machine, it is advisable to create a photo book online and sit in the nostalgic ‘Hall of Fame’. Make your own Photo Book - Be a time traveler, literally (with no change in gravity, assured).